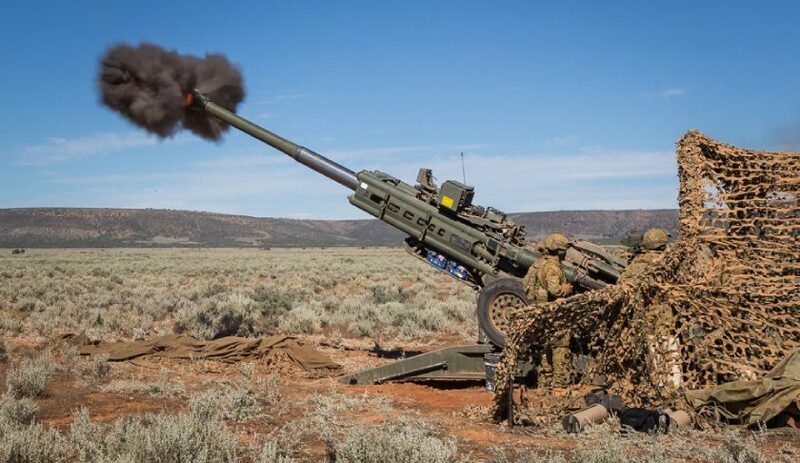 The Australian Army’s Royal Regiment of Australian Artillery has successfully tested the new Sensor-fused Munition for Artillery (SMArt) 155mm round, demonstrating a major new capability. The test of the SMArt 155mm round was held during Exercise Chimera at the Shoalwater Bay Training Area near Rockhampton. Lieutenant Colonel Paul Duncan, Commanding Officer of 4 Regiment, RAA, said that up until now the Australian Army artillery had lacked a capability to efficiently and effectively engage and destroy heavy armoured fighting vehicles, such as main battle tanks. "The round is specifically designed for long range, top attack. Each round contains two submunitions which descend over the battlefield on parachutes, identify armoured vehicles using advanced sensors, and then fire an explosively formed penetrator warhead into the target," LTCOL Duncan explained. "The introduction of the SMArt 155 projectile gives us that a capability to create a dilemma for enemy commanders by disrupting armoured approaches at operationally significant ranges, in all weather and terrain." Director Combat Support Program, Colonel Andrew Langford, said the exercise indicated the Australian Army was a capable and ready land force. "We are now prepared and ready for warfare on the contemporary battlefield, but we are continually looking for ways to be ready for future challenges in an ever-changing environment. We are achieving this challenge by working closely with our partners in defence industry," COL Langford explained. Exercise Chimera was conducted on 24 and 25 March by three regiments of the RAA – Townsville-based 4th Regiment, Darwin-based 8th/12th Regiment and Brisbane-based 1st Regiment.